The origins of the American Water Works Companies was a partnership by brothers James S. Kuhn and William S. Kuhn under the name W.S. Kuhn and Company, which was formed in 1882 and was based in their hometown of McKeesport, Pennsylvania. William S. Kuhn formed five water companies, including one in Muncie, Indiana, where their father, John S. Kuhn (1813-1883), lived and owned the local gas company. Wellsville NY Wellsville Water Company September 29, 1883 December 1, 1883 Sold to the Village of Wellsville on September 1, 1915 for $75,000. Sioux Falls SD Sioux Falls Water Company June 26, 1884 November, 1884 Franchise expired in 1884 and city built new system. Supplied by Connellsville Water Company, which bought the system before 1911. The Kuhn brothers joined with others to form the American Water Works and Guarantee Company (Limited) under the 1874 Pennsylvania partnership law on August 20, 1886. Using a partnership allowed the firm to own stock in the water and gas companies they built and bought, whereas corporations could not own stock in other companies. $400,000 of the paid up capital came from stock in the above five companies, plus the Hornellsville Water Company and gas light companies in Braddock and Muncie. New Jersey greatly liberalized their corporation laws in 1889, allowing incorporated companies to stock stock in other corporations. The company's investors organized the American Water Works and Guarantee Company in New Jersey on January 26, 1891, which took over and operated the 1886 limited partnership. The new company built and bought several water systems, but also invested heavily in irrigation systems in the west, which stretched its finances to the breaking point and it was declared bankrupt in 1913. The reorganized company was incorporated in Virginia as the American Water Works and Electric Company. This company was taken over by new parties in 1927, who reincorporated under the same name in Delaware. Pages 17-18: Letter from W. S. Kuhn, General Manager of the American Water Works and Guarantee Co., Limited, April 27, 1889. 1889 "It is a Leviathan," Pittsburgh Dispatch, May 21, 1889, Page 2. Annual meeting and elections of the American Water works and Guarantee Company. Owns thirty water works plants. 1891 Certificate of Organization of the American Water Works and Guarantee Company, January 26, 1891 (New Jersey) Stockholders: David W. Hitchcock, James S. Kuhn, William S. Kuhn, Edmund C. Converse, and William J. Curtis, J.H. Flagler, William S. Eaton, Charles H. Payson, and George J. Gorman with a capital stock of one million dollars. As a part of said business and purposes to take over, acquire and continue the business, property, good-will and effects of the American Water Works and Guarantee Company, Limited, of Pennsylvania. Page 480: Edmund Cogswell Converse, Vice-President National Tube Works Co.
1901 "David W. Hitchcock," St. Albans Daily Messenger, March 26, 1901, Page 2. At the time of his death he was president of the American Water Works Guarantee Company, of Pittsburg. 1901 Silver Lake Record (Silver Lake, Indiana), April 12, 1901, Page 2. The will of David W- Hitchcock, wealthy Boston merchant, gives $100,000 to Wellesley College with a proviso excluding Roman Catholics and colored persons. 1902 "William S Eaton," The Pittsburgh Press, June 3, 1902, Page 2. Operates forty water works plants, serving some seventy-five municipalities. 1910 Reception to Mr. John H. Flagler : McKeesport, forty years after. Page 913: American Water Works & Guarantee Co.
Official statement of the New York Stock Exchange in connection with the listing of the 6% cumulative participating preferred stock. Page 1003: American Water Works and Guarantee Co. Built local water works plant and American Water Works Company was organized and for several years had is offices here - Will S. Kuhn lived in Muncie and has for years kept in touch with city. 1913 "Kuhn Brothers Well Known Here," The Star Press (Muncie, Indiana), July 8, 1913, Page 12. 1913 American Water Works and Guarantee Company in receivership, July 15, 1913. 1914 American Waterworks and Guarantee Company : plan of reorganization and syndicate agreement, January 16, 1914. 1914 Incorporation of the American Water Works and Electric Corporation, April 27, 1914. (Virginia) Capital stock $25 million. 1914 "Big Company Transferred," Pittsburgh Daily Post, May 3, 1914, Page 4. Receivers turn over assets of American Water Works and Electric Company. 1914 Am. Water Works & Electric, The Wall Street Journal, April 29, 1914, Page 6. 1914 Poor's Manual of Public Utilities; Street, Railway, Gas, Electric, Water, Power, Telephone and Telegraph Companies, June, 1914. Page 559: American Water Works and Guarantee Co.
1915 First Annual Report of the American Water Works & Electric Company (Incorporated) for the year ending June 30, 1915. 1915 "American Water & Electric Report Shows Much Progress," The Wall Street Journal, September 3, 1915, Page 6. Water works subsidiaries serve a population of 1,242,125, with 181,943 customers in 87 cities and towns. 1915 Poor's Manual of Public Utilities; Street, Railway, Gas, Electric, Water, Power, Telephone and Telegraph Companies, July, 1915. Page 2081: American Water Works and Electric Company, Inc.
1916 Second Annual Report of the American Water Works & Electric Company (Incorporated) for the year ending June 30, 1916. 1916 Poor's Manual of Public Utilities. Page 2110: American Water Works and Electric Co., Inc. Page 1700: American Water Works and Electric Co., Inc.
1917 Third Annual Report of the American Water Works & Electric Company (Incorporated) for the year ending June 30, 1917. 1918 Fourth Annual Report of the American Water Works & Electric Company (Incorporated) for the year ending June 30, 1918. Page 2458: American Water Works and Electric Co.
1919 Fifth Annual Report of the American Water Works & Electric Company (Incorporated) for the year ending June 30, 1919. 1920 Sixth Annual Report of the American Water Works & Electric Company (Incorporated) for the year ending June 30, 1920. 1922 "National Tube Founder, John H. Flagler, Dies," Pittsburgh Post-Gazette, September 9, 1922, Page 8. 1922 Ninth Annual Report of the American Water Works & Electric Company (Incorporated) for the year ending June 30, 1922. 1927 "Charters filed at state house," The Morning News (Wilmington, Delaware), June 17, 1927, Page 12. Dover, June 16. American Water Works and Electric Company, Incorporated. 1934 Relation of Holding Companies to Operating Companies in Power and Gas Affecting Control, 73d Congress, 2d Session, H. Rep 827, part 3. 1936 The American Communities Company was incorporated in Delaware on August 28, 1936. 1936 "More New Corporations are Chartered at Dover," The Morning News (Wilmington, Delaware), August 29, 1936, Page 14. Page 163: PAYSON, Charles Henry, banker, was born in Portland, Maine, Apr. 12, 1853, son of Charles and Ann Maria (Robinson) Payson and a descendant of Edward Payson, a native of Nazing, Essex, England, who came to Massachusetts in 1635, the line descending from him and his wife Mary Eliot through Rev. Samuel and Mary (Phillips) Payson; Rev. Phillips and Kezia (Bullen) Payson; Rev. Seth and Grata (Payson) Payson, and Rev. Edward and Louisa (Shipman) Payson, the grandparents of Charles H. Payson. His grandfather (q.v.) was one of the most eminent Congregationalist clergymen of his generation. Following his graduation at the Portland high school in 1870 Charles H. Payson entered the employ of his uncle Henry Martyn Payson, who in 1854 had founded a brokerage and investment business in Portland under the name of H. M. Payson & Co. When his uncle withdrew from the firm in 1886 Charles H. Payson succeeded him as president, retaining this position until his retirement in 1929. Early in his business career he became interested in private water works companies and soon was nationally recognized as an expert in the development, management and financing of such enterprises. At his suggestion the American Water Works & Guarantee Co. was organized in 1888 for the purpose of building, buying and operating water companies, and he was a director of this company until he resigned in 1908, following the decision of the company to go into irrigation projects. A public-spirited citizen, he was prominently associated with social, welfare, educational and religious organizations. He was conspicuous for his widespread generosity and for his deep sense of personal responsibility for the success of the various causes in which his interest was enlisted. One of his major interests was the Maine general hospital in Portland. Elected an assistant incorporator in 1874, he afterward became a director and during the latter years of his life devoted much of his time to the raising of funds for the institution. In religion he was a Congregationalist. He was a lover of outdoor life and recreation and was widely known as a chess expert. His integrity, friendliness and Christian character commanded general respect and affection. Bowdoin college awarded him an honorary A.M. degree in 1914, "in recognition of his character, eminent citizenship and beneficence." He was married Dec. l, 1886. to Margaret, daughter of Eliphaet Haskell Merrill, of Portland, and they had three children: Margaret, Phillips Merrill and Elinor Payson, wife of Douglas Rulison Coleman. He died in Portland, Maine, Apr. 27, 1933. 1946 American Communities Company name changed to American Water Works Company Inc, March 19, 1946. 1947 American Water Works and Electric Company, Inc. was liquidated and the water interests were transferred to the American Water Works Company. 1952 In re American Water Works & Electric Co., 107 F. Supp. 350, September 17, 1952, United States District Court, District of Delaware. On October 15, 1947, American Water Works and Electric Company, Inc. was liquidated under § 11(b) and (e) of the Public Utility Holding Company Act of 1935, 15 U.S.C.A. § 79k(b, e), under two plans approved by the Securities and Exchange Commission and enforced and approved by this court. Under these plans a subsidiary of American, American Water Works Company, Inc., through which American had controlled approximately one-half of its water company subsidiaries, acquired American's other interests and water companies. Water Works was reorganized whereby two of its subsidiaries, Community Water Service Company and Ohio Cities Water Corporation, were liquidated and dissolved. Assets of Community and Ohio Cities were transferred to Water Works. Includes extensive information on Kuhn's investments in Idaho irrigation projects and subsequent bankruptcy. Payson first became involved in water bonds when the Portland Water Company was formed in 1866, the same year that a great fire destroyed more than 200 acres in the heart of Portland, including Payson's own offices. It was a major blow to the local economy, given that an estimated $10 million in property was destroyed and only a third was insured. Payson helped to buoy the city's confidence by immediately making a public declaration that he would rebuild his office on the old site and vowed to be back in business there within six months. In many respects, a reliable water supply available to combat fires was of even greater importance during this period than healthy drinking water. New York City, for example, was in great need of unpolluted water, but it was only due to the threat of large-scale fires that the leading American city saw fit to build a modern water works. In Portland the idea to tap into nearby Sebago Lake was first suggested in 1854, due to a drought that led to a short supply of water, but it was not until February 1866 that the Portland Water Company was incorporated. The fire that devastated the city on July 4 helped to spur the actual launch of the company. Water from Sebago finally began serving Portland in November 1869. Unfortunately, the company was poorly funded and managed. The main had not been properly laid, significantly hampering the flow of water. After the company twice succumbed to bankruptcy, Payson in the early 1870s was induced to join the board and help place the company on a solid financial footing. He was instrumental in securing the funds necessary to improve the infrastructure and turn Portland Water into a profitable business. It also marked Payson's entry into the water business, which became a main interest of the company for several decades. As a result of his conservative approach, Paysons' clients were not wiped out like so many investors when the panic of 1873 hit the country, leading to a harsh five-year depression. During this time, in 1874, Payson took on his first partner, George F. Thurston, whom he had groomed since Thurston had graduated from high school and went to work for him as a clerk. A third partner joined the firm in 1879: Payson's nephew, Charles H. Payson, who like Thurston had no more than a high school education and worked his way up, also starting out as his uncle's clerk. Charles Payson's tenure would last more than 50 years and his influence on the firm's growth, both nationally and internationally, was so pronounced that he was considered H.M. Payson & Co.'s second founder. Seven years after becoming a partner he became president when Payson chose to retire. Under Charles Payson's leadership the firm became even more committed to the water business. In 1888 he traveled to London to sell $1 million worth of bonds in the Portland Water Company to help shore up the utility's finances. Moreover, he represented another $1 million in water for nine other water companies, including ventures in Elmira, New York; East Greenwich, Connecticut; Kokomo, Indiana; Sheboygan, Wisconsin; Wichita, Kansas; Fort Smith, Arkansas; Huntington, West Virginia; Meridian, Mississippi; and Merrill, Wisconsin. On that trip he also sold securities for the Marion (Indiana) Gaslight Company. In addition to selling bonds, Charles Payson became involved in running several water companies that he helped to found or acquired. The firm also underwrote any number of utility bonds during the final decades of the 1800s. The firm's interests spread from coast to coast, touching more than 100 utilities and leading Payson to become known as "The Water Bond House." Charles Payson and several outside partners in 1886 created the American Water Works and Guarantee Company, which built and developed water companies across the country. Soon joining him would be two Payson partners: George S. Payson, the founder's son, who became a partner in 1883 and Herbert Payson, who became a partner in 1889. The three men acted as American Water Work's financial agents. When the firm formed American Water Supply Co. in 1888, the Payson partners added operational responsibilities as well. Payson now acquired control of water companies as far away as Kansas and ran them out of the Portland office. Even after American Water Supply was liquidated, the investment firm remained involved in the water business. In 1926 two Payson partners--Herbert Payson and Harold C. Payson, who became partner in 1919--and five outside partners formed a utility holding company called Consumer's Water Company, which not only housed some of the partners' water assets but also acquired companies, so that by the early 1930s the venture controlled ten subsidiaries in seven states. Payson maintained a connection to the company until 1999 when Philadelphia Suburban Water Company acquired it. 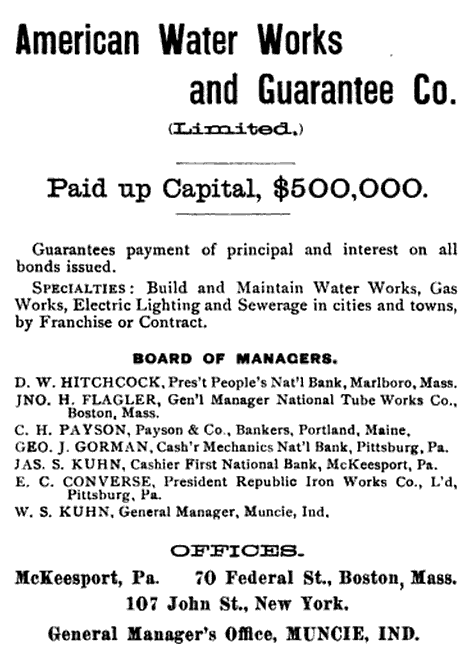 Also of note, was Payson's acquisition of Lewiston Gas Light Co. in 1899. The firm developed the utility, which became a highly successful New England company, now part of Northern Utilities Inc.